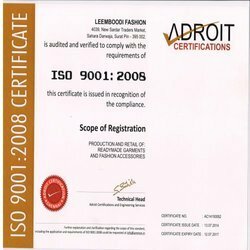 Established in the year 2014, we, Leemboodi, are one of the leading manufacturers, exporters, wholesalers, traders and retailers of Ladies Apparel. Offered product range consists of Ladies Anarkali Suit, Lehenga Choli, Georgette Sarees, Ladies Salwar Suit etc. The fabric yarns, which are best in the market, are used by our professionals to craft and design these sarees and suits in compliance with the latest and prevailing fashion trends. Offered ladies dresses are highly appreciated among our customers for their rich attributes such as eye-catching design, vivid color combination, appealing appearance, smooth finish, aesthetic pattern, lightweight, optimum colorfastness and shrinkage resistant. Owing to this, these suits and sarees are extremely demanded in the market. In addition to this, due to our large production capacity, we have been able to meet the bulk orders. Due to this, we have gained a remarkable position in this domain in such short period of time. Being a quality conscious name, we assure that quality is not compromised. For this, we have appointed a team of skilled quality inspectors. Our team of quality controllers is trained at regular intervals and they hold expertise in their area of operation. Under the direction of our mentor, Mr. Hiren Lathiya, we have been able to cater to a huge clientele across the world. Owing to his experience of this, he has helped us in catering to the needs of our valuable customers in the most efficient manner. Owing to this, we have been able to attain maximum client satisfaction. We, Leemboodi, are backed by a workforce that is trained at standard intervals of time under the leadership of our mentor, Mr. Hiren Lathiya. Our employees in enhance their professional and technical skills by using the training provided by us. Selected after rigorous procedures, they hold expertise in their area of operations. In addition to this, by working in close coordination with customers, they have been able to cater the needs of our customers in the most efficient manner. They work in close coordination and proximity with each other to ensure a hassle-free workplace. For designing high-quality ladies dresses, we have set up a well-equipped infrastructural facility that is well-equipped latest weaving machines and tools. In order to effectively handle different units of our infrastructure, we have appointed machine operators and other supporting staff. in addition to this, we have divided our infrastructure at Leemboodi into several units to ensure that all the processes are carried out in a smooth manner. Spread over a vast area, our infrastructure is upgraded with advanced and sophisticated tools. Being a quality conscious name, we assure that the quality is never compromised. For this, at Leemboodi under the able supervision of our mentor, Mr. Hiren Lathiya, we have appointed a team of quality controllers that is regularly trained through workshops and seminars. In addition to this, we have set up an in-house quality testing unit, to ensure that best possible quality of the offered products is always maintained. For this purpose, the high-quality fabric yarns are procured from authorized vendors of the industry. By implementing different customer-driven approaches, we at Leemboodi have been successful in attaining the trust of our valuable customers. We accept multiple modes of payment, for the ease of our customers. In addition to this, we believe in setting up a strong and unbreakable relationship with our clients by providing them with high-quality product range. For delivering the offered designer suits and sarees, we have maintained a vast distribution network. Our distribution network is well-connected with different modes of transportation such as rail and roads. We manufacture these products under the brand Leemboodi.